The work of Harold Pinter has always baffled me more than some of his mid-century contemporaries in the theater. His plays are often grouped with Samuel Beckett's because of their ambiguity and brushes with the absurd, but where Beckett delights in the beauty and music of language, Pinter is obsessed more with how language is used to mislead, confuse, and beguile. While both playwrights created compelling pieces of theater that are open to myriad interpretations and that serve gifted actors especially well (in particular works like Pinter's No Man's Land and Beckett's Waiting for Godot, which were performed in repertory by the same four-man company on Broadway several years back featuring Sir Ian McKellen, Patrick Stewart, and Billy Crudup), Pinter's worldview comes with a greater sense of danger and darkness than Beckett's, and much less delight. Also, Pinter seems to take pleasure in manipulating and upsetting his audience, and confounding their understanding of his characters -- something I've never been a huge fan of -- while Beckett always leaves you floating off into the pleasure of his poetry, even if his characters remain bereft. I'm comparing Pinter and Beckett here because they are both favorites of longtime ACT artistic director Carey Perloff, who has just directed Pinter's The Birthday Party as the last directorial outing of her swan-song season at the company. This play, Pinter's second to be produced back when he began writing in 1957, has plenty of light moments and great comedy embedded within its confusion. But at its darkened heart, The Birthday Party is about loneliness and lies -- both the lies we tell the world, and those that we tell ourselves. This latest ACT production is not going to shed much new light on the 60-year-old play for those revisiting it, but what it lacks in reinterpretation it makes up for in the stellar performance of TV and film vet Judith Ivey as Meg, the lower middle class keeper of a seaside boarding house that has, for a year, had only one boarder. Ivey brings humor, empathy, and a stubborn sense of wonder to a character that Pinter clearly designed to provide comic relief in the script, but who also represents the role of the innocent in a world of untruths and menaces. Meg's husband Petey, played well by ACT stalwart Dan Hiatt, is her numbed and only semi-conscious foil, going about his daily routine of tea and the newspaper while Meg chatters on and pesters him with mindless questions. Stanley (Firdous Bamji), the boarder and clearly the only joy in Meg's life, meanwhile takes advantage of Meg's kindnesses and treats her cruelly in return, much like an ungrateful son. Meg meanwhile seems to know very little of Stanley's life before he arrived at the house -- he mentions having played piano "all over the world," but this is ultimately reduced to "I once gave a concert" -- and some other dubious aspects of his past come back to haunt him in the form of two mysterious gentlemen (Scott Wentworth and Marco Barricelli) who arrive to stay the night. It's the same night that Meg decides to throw Stanley a party for his birthday, even though he denies several times that it is, in fact, his birthday. What transpires is a confusing and menacing series of speeches and exchanges involving the two strangers, all of which Meg is oblivious to and which appear to be driving Stanley quickly mad. The tiny party, which includes the addition of a twentysomething woman neighbor (Julie Adamo) ends in disaster and chaos. Pinter is intent on keeping all of us in the dark about Stanley's true identity, or the reason for the two mens' visit -- it feels like a metaphor for the inability to escape one's past, or maybe something about fascism. And as confused as the audience is left feeling about Stanley's fate, or his sketchy past, Firdous Bamji, the actor playing him, also gives a somewhat confused if compelling performance of his unraveling. It's a play that demands interpretation, but also confounds much interpretation because of the ways the characters contradict themselves -- it's hard even to know what the two interlopers' real names are by the end. And in so doing it's a play that rewards the intellectual who comes looking for something to parse, but frustrates anyone who comes seeking a digestible narrative or characters to empathize with. Perloff says she wanted to end her final season of directing with The Birthday Party because the play is "incredibly disturbing and hilariously funny," and because ACT's audience typically "adores" Pinter's work. I have to say it's a curious choice to cap off 25 years leading the Bay Area's oldest repertory company but obviously it's a meaningful one to her -- as she explained in this interview with American Theatre at the beginning of the season, it's a play she personally worked on with Pinter himself when she was heading up Classic Stage Company in New York in her twenties, in the 1980s, and she's never had the chance to put it on at ACT. The chance to work with Judith Ivey one more time also played into the choice, and for that we can be grateful. It's been a long while since I've seen a seasoned performer do so much with a role that, in another actor's hands, might have come off as a joke. Ivey's performance alone is worth the price of admission, and she saves the play from being totally devoid of humanity. Where the other character's come off as devices in Pinter's unsolvable puzzle, Ivey's Meg is our sweet and hopeful touchstone, demanding nothing of people except that they come down for breakfast. 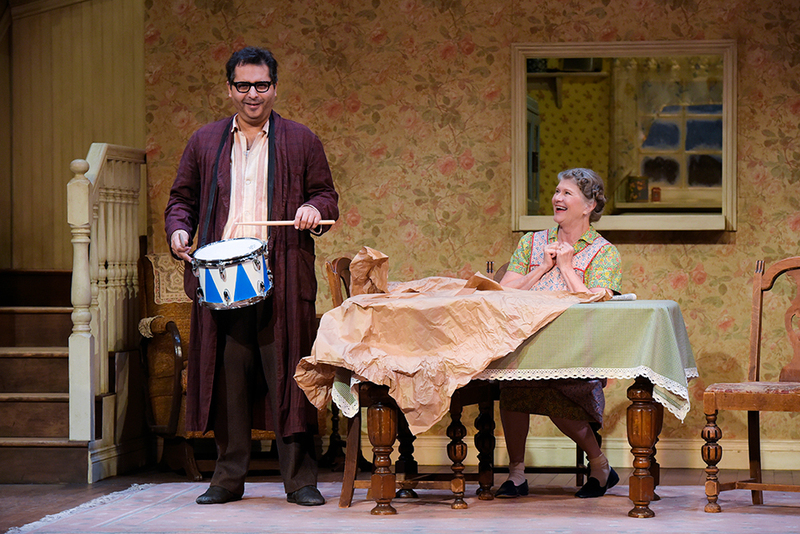 'The Birthday Party' plays through February 4 at the Geary Theater in San Francisco. Find tickets here.